For most Indian employees, the Diwali gifts come in the form of Indian sweets. However, Savjibhai Dholakia, a diamond merchant in Surat, is once again ‘gifting’ cars and flats to his employees as a bonus. 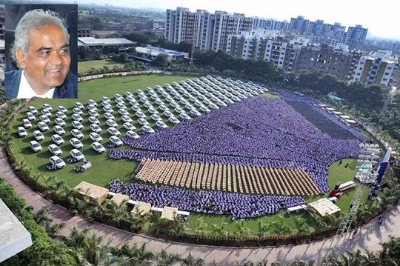 His employees have received 1,260 cars, 400 flats and jewellery ahead of the Diwali weekend. Even as the social media is celebrating his ‘generosity’, Knappily extracts the truth out of the numbers. What brings Mr. Dholakia in the limelight again? 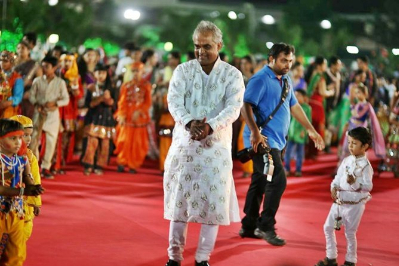 Savjibhai Dholakia, a Surat businessman who is the owner of Hare Krishna Exporters that trades in diamonds and textiles, has again decided to give employees at his firm cars and houses as Diwali bonus. Hare Krishna Exporters employs more than 5500 people. The company has an annual turnover of Rs 6,000 crore. It is said to be one of the leading polishing companies in India’s diamond hub Surat and exports diamonds to some 75 countries. As many as 1665 employees, who will be the beneficiaries of (1260) cars, (400) flats and boxes of jewellery, have been chosen based on their performance. 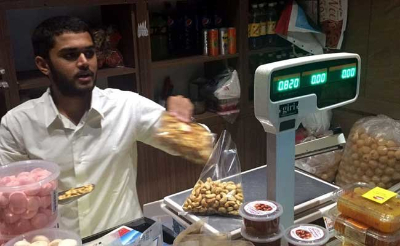 Around 1200 of these 1665 employees earn between Rs 10,000 and Rs 60,000 per month. 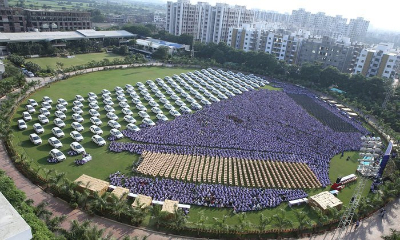 Dholakia will give away 1260 cars to its staff. As many as 56 employees will get jewellery boxes. “Our aim is that each employee must have his own home and car in the next five years. So we have decided to gift cars, homes and jewellery to employees,” Dholakia says. The company would spend an estimated Rs. 50 crore ($7m) under the loyalty program to reward his best-performing staff. Why is his 'generosity' being celebrated? Indian bosses traditionally give presents to staff at Diwali. Few can compete with the generosity of Savji Dholakia. An unusually generous boss is just that - unusual. 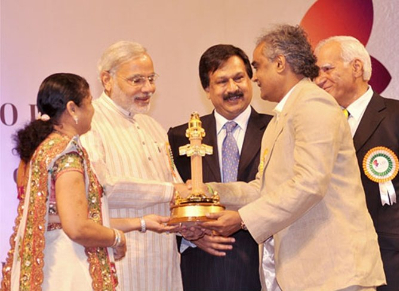 Dholakia has attracted global attention for his lavishing expensive pre-Diwali gifts. Diwali, the biggest of India's many Hindu festivals, is a time of celebration and gift-giving. Employers often give their workers bonuses, presents or - more often than not - boxes of Indian sweets. But Dholakia, dubbed India's most generous boss, has been setting the pace for years. He says he gave three of his top employees their own vehicles 20 years ago, and he has run various incentive programs ever since. “Kaka”, as the chairman is known to staff, has also insured 280 employees who have been with the company for more than a decade to the tune of Rs. 80 lakh ($130,000) each, and ensures that employees’ families get to go on annual pilgrimages at company cost. The social media has taken a liking to this ‘unprecedented’ act of generosity.‘Be my boss’ is what the employees of India are asking him to do. Those who are not fortunate to work in Hare Krishna Exports have to do with a box of Indian sweets or dry fruits during Diwali. When do we see the truth? This is how the Oxford Dictionary defines the word ‘gift’ - A thing given willingly to someone without payment. All these flats and cars come with payment. The employees will have to pay EMIs to service the cost. Those things - flats and cars - cannot be called gifts. Even though the intentions of Mr. Dholakia may be good, the fact that the gifts come with an EMI which will be paid from the salary of his employees gives us a clearer picture of the scenario. These gifts do make a lot of business sense actually. The boss makes the down-payment and pays part of the EMI for the next 5 years (this is what Mr. Dholakia is doing). The employee will have to remain with the company for at least 5 years to benefit from this facility and get the papers in his name. We can safely bet that ‘India’s most generous boss’ is not gifting the papers of the flats and cars yet. Also, these 50 crores are not one-shot payment. He would have made some down-payment now, and pay the remaining over five years as part of the employee’s EMI. Fame: Aren’t we talking about him Haven’t you been sharing his story on Facebook Fame matters and it makes a lot of business sense too. His story has also featured in international media. Retention: The employees will remain with him longer for two reasons - 1) They are happy the boss has got them this deal (yes, it is a deal, not a gift) or 2) To truly own the flat or car, they have to serve for at least 5 more years in Hare Krishna Exports. Marketing: Hare Krishna Exports is now a household name in India. This spurt in popularity will result in more orders in the coming years. Note: We appreciate that Mr. Dholakia cares about his employees and wants them to own a flat and a car. The numbers above are only to help us understand that there are many other companies with similar policies which are rarely talked about because they do not call their EMI schemes as ‘Diwali gifts’. Hari Krishna Exports Pvt. Ltd., also known as HK, is an Indian diamond conglomerate, headquartered in a 25,000 sq. feet office in The Capital, Bandra Kurla Complex, Mumbai. HK was established in 1992 by Savji Dholakia and his three brothers. HK is exporting polished diamonds to 79 countries. Currently, HK manufactures over 40,000 carats of diamonds every month (500,000 carats every year). 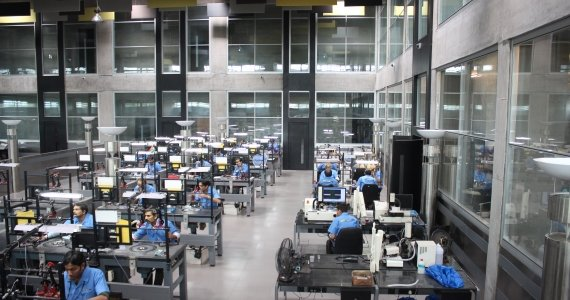 In 1992, HK started as a small-time diamond cutting and polishing unit in Surat with a few machines and employees. It later expanded to Mumbai to meet a growing demand for raw diamonds. In 2005, HK launched its own jewellery brand - KISNA. Today, it is the largest distributed diamond jewellery brand in India, available in over 6,250 jewellery outlets. The Diamond Research and Mercantile City, also known as DREAM City, is an upcoming business district in Surat. It will be built on 2,000 acres of land near Khajod, along the lines of the Gujarat International Finance Tec-City and Dholera Smart city near Ahmedabad. Expected to open in 2017-2018, it will be Gujarat's third smart city. India's second diamond trading centre, the Surat Diamond Bourse, will operate from DREAM City. Its major role will be trading unpolished diamonds and manufacturing polished diamonds. The Diamond Bourse is expected to have services for import and export of diamonds, as well as banking and insurance services. Presently, diamonds are polished at Surat and traded at India's sole diamond exchange, Bharat Diamond Bourse, in Mumbai. Who else brought Mr. Dholakia in the news this year? Mr Dholakia's 21-year-old son, studying business management in the US, has now laid claim to his own share of headlines. In service to a family tradition, Dravya was dispatched for a month to Kerala with “three sets of clothes and a modest portion of cash (Rs. 7000) for emergency use only” to find employment and lodging in a city in Kerala he had never visited.He had do stay incognito. Dravya decided to stay and work in Kochi as he didn't know Malayalam and Hindi is not commonly spoken there. He later revealed was rejected at 60 places, as “no one knew me here”. He lied to his employers that he is a class XII student born in a poor farmer's family in Gujarat. Dravya Dholakia first got a job in a bakery in Cheranelloor. Then he worked at a call centre, a shoe shop and even McDonalds in the city, earning Rs 4,000 plus in a month. Dravya is thankful for this eye-opening opportunity. “I come from a fairly privileged background, a place where we can get things without looking at the price tag. So it's difficult to understand the value of money. The idea behind the expedition was that: to understand the value of money and also find out the struggles of people”, he added. How did he create his business empire? 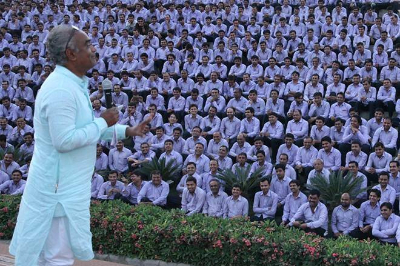 Dholakia’s company is now worth Rs 6000 crore with its footprint in 75 countries. But he had a humble start. Born in a farming family at Amreli in Saurashtra region of Gujarat, Dholakia reached Surat as a 13-year-old school dropout in the late 1970s to make his fortune in the diamond cutting and polishing business. Dholakia joined his paternal uncle, who was already engaged in the diamond trade. Dholakia dreamt of setting up his own diamond cutting and polishing unit. It materialised with Hari Krishna Exports which was set up in 1992. His three brothers were also partners in the company. Dholakia was the second of four brothers. They also set up an office in Mumbai and started exporting diamond to the US and European countries.The company exported diamonds worth Rs 1 crore in its first year itself. Dholakia gives credit for this to his employees. A verified Facebook page on Dholakia says that Hari Krishna Exports Pvt. Ltd. has grown from strength to strength till now. In 1994, the diamond exports increased multifold after an Israeli client’s referral to the international clients. In 2001, the ambitious export company made yet another leap as it started to trade and manufacture diamonds of sizes ranging from 0.18 Carat to 0.96 Carat. In the fiscal year 2002-03 Hari Krishna Exports Pvt. Ltd. recorded a 200% growth.